Ocean Place Resort And Spa from midtown Manhattan and the Newark New Jersey International Airport it is but a short journey to this premier oceanfront resort on the Atlantic coast between New York and Atlantic City. More than just a hotel on the Jersey Shore this magnificent oceanfront resort offers breathtaking views of the Atlantic Ocean. Whether you are looking for the perfect spa resort destination or a weekend beach escape Ocean Place Resort And Spa is the perfect getaway. Ocean Places outstanding recreational amenities include indoor and outdoor pools whirlpools and a fully equipped fitness center. In addition with the exciting new Pier Village development directly adjacent to the resort guests can enjoy exclusive shopping dining and entertainment options as well as a relaxing promenade to take in the inspiring surroundings. Or if a beachside stroll is more your style you can enjoy a walk along the boardwalk bicycle or play in the waves along our private beach. Each room features a view of the ocean and a private balcony. Come discover the best kept secret at the Jersey Shore. 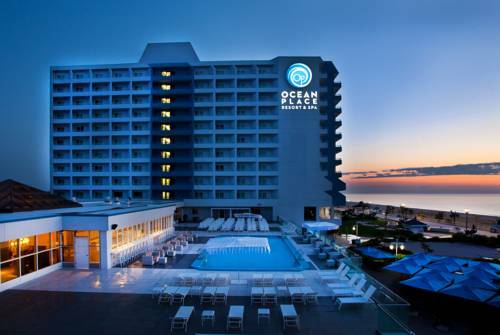 Ocean Place Resort and Spa from midtown Manhattan and the Newark New Jersey International Airport it is but a short journey to this premier oceanfront resort on the Atlantic coast between New York and Atlantic City. From Jan 1-May 21 and Sept 7-Dec 31 Cancel 72 hours prior to arrival to avoid a penalty of one nights room and tax. From May 22-Sept 6 Cancel 7 Days prior to arrival to avoid a penalty of one nights room and tax. Open daily 2p-12a Classic nautical themed pub featuring 4-regulation billiards tables sofas and chairs overlooking the Ocean. The lounge also features entertainment on most Saturday evenings. ~12 miles from Long Branch. ~25 miles from Long Branch. ~27 miles from Long Branch.